In my last post I explained how it dawned upon me to display my bare tree images in a way that accentuates their shape and makes the intriguing shapes that nature can take the center of focus. For the next few posts I would like to show some other images from that series, which I continue to work on. This is the final image from my self assignment of trying to make several interesting photographs from just a single leaf taken during a visit to my local botanical garden. The others in the series can be found here, here, and here. I was pleased with the results of this self-challenge and will likely continue with them again when I feel my creativity wane. Sometimes, when the creative juices seem to be lacking, too many choices lead to not doing anything at all because none of the choices are ‘good enough’. Remove those choices so that there is only one thing that you allow yourself to focus on and you have no choice but to start making photos and end up with little else to concentrate on but trying to see what it is you are photographing in many different ways. As Minor White famously said “One should not only photograph things for what they are but for what else they are”. I thought I would continue showing some images from my self assignment of trying to make several interesting photographs from just a single leaf taken during a visit to my local botanical garden. I do like how the series flows and shows many aspects of just the one thing. My friend and teacher, the late Nancy Rotenberg, used to say that by spending time focusing on and photographing just one ‘thing’ you could push yourself to go ‘beyond the handshake’; getting to know it and showing it to others in more depth. In my last post, I wrote about my self assignment of trying to make several photographs from a single leaf during a visit to my local botanical garden. And so here we have the second composition. The first can be seen here. I did find this self assignment challenging and hope to have a few more images in the group. Last week I found myself, along with several friends, at Phipps Botanical Gardens, a place we photograph at quite a bit in the colder weather. Now, I have mentioned on the blog that I plan to try to get out in the snow to make photos this winter, but right now it’s cold, the fall color is gone, and there is no snow. So it was off to Phipps. This time I ended up deciding to give myself a challenge. A self-assignment, if you will. And self- assignments always seem to be a good way to spur creativity. As I was walking around the botanical garden looking for inspiration I just wasn’t feeling any. So the self assignment I gave myself in order to try to see further was….could I make several images that I liked from one single leaf? It actually turned out to be quite a bit of fun to see what I could come up with and I did start to feel the urge to create return! I hope you might be interested to see several views of this particular leaf over the next few posts. In the meantime, I heartily endorse the idea of self-assignments when you just aren’t feeling it…..if you know what I mean. ‘Intentional Camera Movement’ (which until a few years ago was simply known as ‘hey, look at this cool photo I made by shaking my camera’ - but I guess ‘ICM’ is a bit easier to say than ‘HLATCPIMBSMC’), is a process by which one can make abstract images in-camera. While usually one wants the camera to be perfectly stable when the shutter is open in order to make sharp images, the technique of intentional camera movement seeks just the opposite. Here the idea is to intentionally move the camera while the shutter is open in order to make abstractly blurred photographs. I have seen many ‘guides’ that suggest different techniques, but my feeling is that there is no right or wrong when it comes to this……experimentation is the key. It is difficult to state a ‘proper’ shutter speed because it depends on how fast one is moving the camera and if the subject is itself moving or not. Once you get a composition that looks promising, the key is to try multiple different variations in shutter speed and speed of camera motion until you get something the is pleasing and ‘just seems right’. It really pays to experiment, as sometimes even when it looks good on the camera LCD the image isn’t quite as compelling on the larger computer screen. It pays to change it up and decide if you have a ‘keeper’ later, once you get home. In this particular image of trees, I moved the camera along the vertical axis while the shutter was open. In specific, this was made at ISO 100 at f11 with the shutter open for 2 seconds. I actually liked the appearance of the left side of the photo better than the right, so I selected it in Photoshop, used CTL-J to duplicate it onto its own layer, CTL-T to go to transform in order to flip it horizontally, and then the move tool to shift it over so that the left side of the image was mirrored on the right. This is an image that I have actually posted beofre, but as a straight photo. I reworked it using several techniques in order to better have it reflect what it felt like at sunrise at this beautiful location (Pete's Lake near Munising, in Michigan's Upper Peninsula). What did it look like before I attempted to go beyond a 'straight' photograph? It was an equally valid image that I believe also transmits, in a slightly different way, what it was like to be at this idyllic location at sunrise. However, I believe that one has to recognize that the 'straight' photo is also really just my interpretation of the RAW file meant to transmit my impression of what it was like there. So perhaps I shouldn't call it a 'straight' photo, but, rather, a 'straighter' photo. No photo is truly 'straight'; not in the digital age nor in the analog age.....but that is a discussion for a different day. Again, I think they both work in different ways. Which one works best for you? Why? I would love to know! Now this is something really different for me, but I am committed to at least trying different things. I think I at least owe that to my parents after years of not eating my veggies :) The background is composed of three of my tree photos taken from different images and composited together. My idea was not to make an entirely convincing background but, rather, to make an interesting one. That is why the overlap of some of the trees doesn't look quite natural, or perhaps looks a little 'odd'. They were blended together to be just a little 'off', to raise an eyebrow or make you wonder whats not quite right about it. But when I was done with the background, it needed a subject. So I dropped in a model image that came with the course I am taking (fully licensed for any use, of course). Well, she didn't exactly simply 'drop in' since she was in color, much bigger etc. Lets say she was gently manipulated into the photo in an attempt to make her presence at least look realistic against the background. Definitely not my usual type of work, but I am having fun playing! When I was at the Musee d'Orsay in Paris a few years ago, they had a display of paintings by one of the grand old masters.....unfortunately, I can't remember who (if a reader knows, by all means, please remind me). At any rate, given some of the techniques I have been learning and practicing I couldn't help but 'grunge up' the photo I took of the painting a bit. Well, maybe more than a bit. I sort of made it mine. With apologies to that grand master of painting. Another self assignment to digitally transform a photograph utilizing fractals and by 'painting with light'. What are fractals? See those wavy green and orange lines behind the doll....those are fractals, which are blended into the image at low opacity. And 'painting with light'? That is an enhancement of the yellow glow behind the doll done by using the color picker in Photoshop to choose the color of the existing glow and then painting with a soft, low opacity brush in the appropriate area on a new empty layer. Looks messy, but then change the blend mode to color, or soft light, or just experiment...the messy looks goes away and it all blends together nicely. I also obviously added in the musical note embellishment. Where is this all headed? I don't know, but I do know that I'm having fun with it all! In my last post, I wrote about trying to get my photographic thoughts and plans together after having 'completed' my Empathy Project. One of the ideas I had mentioned was delving further into 'Photoshop digital artistry'. I had taken an excellent course in this some time ago, but had really gone through the tutorials listening and watching but not doing.....and that's a mistake. So I have started going through it again, this time giving myself self-assignments to utilize the techniques taught in the tutorials of compositions that seem to be in a style that I like. And the final result is below. What To Do When The Project's Over? Readers of my blog know that over the last year or so I have been working on my Empathy Project, which took up quite a bit of my time. It really was an all encompassing project for me, both time-wise and emotionally. I ended up with 32 portraits and interviews. Once I had completed those, it took me a couple of weeks to prepare the material for submission to a magazine (more on that in a future post, when I hear back). Once that was completed.....well, it's sort of a let down. What does one do next?? How do you decide on the next project? How do you know where you should redirect your efforts? Because I hadn't really done any longstanding projects like this before (well, maybe one, The Carrie Furnace Project) it's a problem I haven't really previously faced. And I know it may sound trivial, but I really am unsure as to where to find inspiration next. So I am doing a few things to help me along. 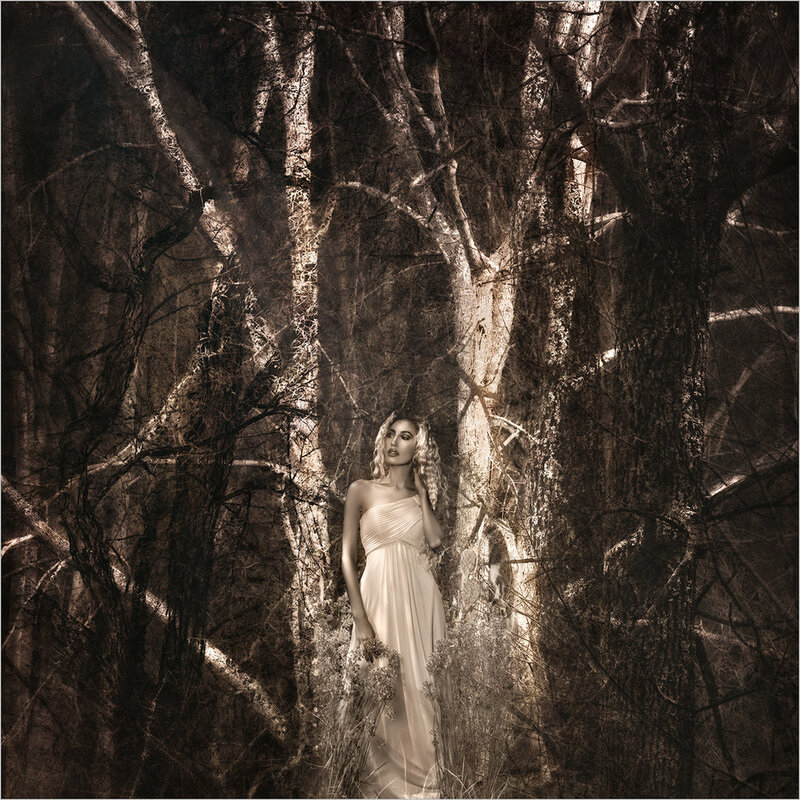 First, in the past, I have had an interest in and taken some courses on 'Photoshop Artistry', the idea of using photographs and Photoshop to create composited pieces of artwork. Though I had gone through the courses and used some of the techniques, it isn't something that I really delved into deeply. And, while I had tried to do some of the 'assignments', I am really not too good at following other peoples project suggestions (despite it being a good way to learn). It just isn't a way that I take to very well. So, I am taking another tact. I am reviewing some of the lessons and when I review a tutorial that shows work and technique that is in 'my style', that I can see myself using, I make up my own assignments to practice the technique. I think I can work and practice better that way. It is something I am trying and we will see where it goes. Who knows, maybe I will even describe and show some of the self assignments and results here. The second thing is that (and here is something that readers probably don't know about me) many years ago I used to raise orchids as a hobby. In fact, I had constructed a growing room in my basement using with high intensity lighting and various sorts of climate control. I finally gave it up because the time involved became too overwhelming. At one point I actually had an article published in 'Orchids', the journal of The American Orchid Society, about how to construct and maintain such a growing area. 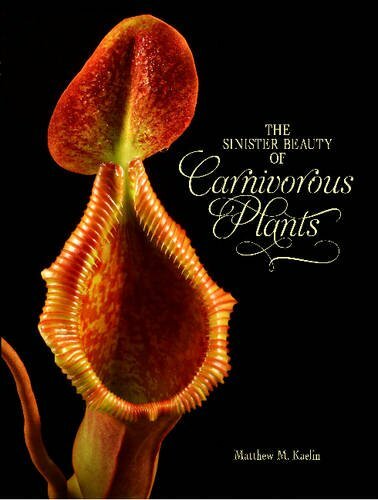 This is a beautiful book with wonderful fine art images of carnivorous plants. Several years ago Beth's carnivorous plant portfolio was published in LensWork. These plants really are bizarrely photogenic in a very abstract way. At this point, I am just trying to put ideas together. If anyone would like to share ideas about how they get inspired or get motivated to 'move on to the next thing', I would love to hear them! Every year, at the end of July through the beginning of August, my 'photo friends' and I make our annual pilgrimage to Jennings Environmental Education Center to see the blooming Liatris spicata, more commonly known as Blazing Stars. While you can perhaps find them growing in gardens, the open prairie of Jennings is the only place in Western Pennsylvania where they grow naturally. The open prairies of the Midwest is otherwise their natural habitat. Every year, besides the 'standard' type photographs, I try to do something a bit different. This time around, I tried to not only photograph the plants, but to also photograph what it felt like to be there surrounded by them out in the open fields. Lately I have been taking a number of on-line courses trying to learn new types of photo artistry techniques, learning to use flash, learning to make composites etc. And the one thing that rings true for learning and improving at all these things is that the improvement comes from the doing. Doing over and over and over again. Defining what you want to learn. Forming projects. Setting deadlines. Intrigued? it really is a great article about how to get better at something...at anything really! "The Year Of 100 Rejections". It's a good and quick read that I wanted to share. And it pertains to photography as much as it pertains to writing fiction. Lately I have found myself thinking about style, or, more specifically, about how people see.....about how I see. They are the same thing, style and how you see, more or less. I think it really is an interesting topic for everyone to ponder. What lenses you most often use gives some insight into this. For me, I tend to use a macro lens and lenses with longer focal lengths more than my other lenses. Of course that doesn't mean ALL the time, but there is a definite preponderance. I tend to see things in little segments or abstract pieces. It's just the way I naturally see best. The image above is a segment from a very large piece of glass art which was on display at a show in the botanical garden that I frequently go to. The piece is actually a massive pitcher plant, but I enjoyed the abstract shapes and colors that you could see in small portions of the glass even more than the piece as a whole. Another good example is my "Mural Project", where I make photographs of very small abstract sections of large urban murals. I got to make some more of these on a trip to San Francisco a week or so ago. The Mission District is absolutely wonderful for murals (and food too)! My parents recently had to move out of their home, my mother to a nursing home and my dad to assisted living. It wasn’t an easy move. My mother is not one for material things, but she loved art and treasured two decorative statues for many years. I was given the statues and decided to photograph them. As I did so, I started to see many interesting compositions....maybe this will become a series? A few weekends ago the weatherman was predicting fog. So I got up early on Sunday morning planning to drive out to Moraine Lake, about 45 minutes from my home. There is a golf course close to my house which I decided to drive through in order to get to the highway. As I was driving through it, I noticed how heavy the fog was and how beautiful the trees looked in it. Then it struck me....why drive 45 minutes hoping the fog doesn't burn off and that it is still over the lake when I arrive, when there is a gift being handed to me right here and right now. As my teacher Nancy Rotenberg used to say, 'take the gift you are given'! So I parked the car and starting making photographs on the golf course. Given the fog, it was pretty empty except for one crazy photographer and a couple of crazy golfers who couldn't see where their balls were going. I respected their presence in the deep fog and they respected mine...."Hey", the call went out, "we are hitting some balls in your direction and we really can't see you or where the balls are going very well". This final image is my interpretation of the scene using some of the techniques I have learned in the digital artistry course I have been taking. I think it transmits the feel of what it was like to be out there that morning! There was a time in the not too distant past when a photograph of a beautiful sunrise seen through fog surrounding a mountain range, complete with alpine glow on the tips of the mountains, would be an image that one would ponder for a bit of time. One could well imagine it hanging in a gallery. As a stock photograph it could be expected to draw two to three hundred dollars per sale. Maybe more. That time has seemingly come and gone. One need only direct their browser (you don't even have to leave the house) to Flickr, Facebook, Instagram, or Google Plus to see hundreds, no, thousands, of photographs like the one described above. True, some are better composed, better processed, or convey feeling better than others.....but there is no denying that there are still many thousands that can be reached with a click that, frankly, are really, really good! And as one browses through such images they might find themselves scrolling through them faster and faster and faster. I believe it's image fatigue.......we get used to seeing so many images, photographs that in another era, before the internet was able to feed us image after image after image, we would have spent time pondering...... that we now just zip through spending a second here or two seconds there. Even photo genres that wowed us just a year or two ago (think milky way across a navy blue sky with a well light-painted foreground) are now available in profusion. It seems that the strategy for some is to go photograph in ever more exotic and hard to get to places. I'm not saying that this is a 'bad' strategy, it's just that one has to have a good deal of time, money, and good health to make it happen. And, of course, while everyone wants to see something or someplace they haven't seen before, rare or unusual or far away doesn't necessarily make the images 'good'; it just makes them images of someplace most people haven't been to (think Antarctica or Iceland). And the more these destinations catch on, the harder it is to be original, even in distant locations. How many pictures of ice on an Icelandic beach have you seen, for example. Others try to photograph from more and more precarious and dangerous viewpoints (think of those photos shot by folks standing on a wall at the edge of a skyscraper with no tethering or protection from a fatal fall). Yes, everyone wants to look at them, but doing these sorts of things to get more 'likes' is just plain stupid. Lets face it, everyone with a cell phone is now a photographer. And I don't mean that in a negative way. "iPhoneography" has become a medium in and of itself, and there is an incredible array of apps and post-processing possibilities that enable one to make art (as opposed to snapshots of your lunch - I still don't get why people do that and why they think others care about it - but maybe that's just because I'm old). "Doubt is what prevents us from achieving goals"
"Doubt is the necessary evil of creativity"
"Creativity is a lifelong pursuit"
A friend of mine introduced me to the wonderful ongoing YouTube video series by Ted Forbes called "The Art Of Photography". It's a great series that I find worth watching in this era when media comes at us a mile a minute. The quotes above come direct from his episode "Creative Doubt". There are some great thoughts in this episode, which is linked below, and I wanted to share it, as I am sure it applies to every artist in all mediums. You might want to subscribe.....I know I did.